BRYAN EATON/Staff Photo. 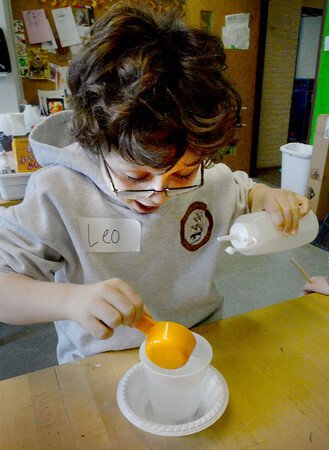 Leo Chase, 8, is amazed as vinegar poured into water and baking soda creates a reaction to lift raisins and uncooked popcorn from the bottom by bubbles. He was one of the youngsters in the Science Club meeting this week and taught by Joann Healey at the Newburyport Rec Center.